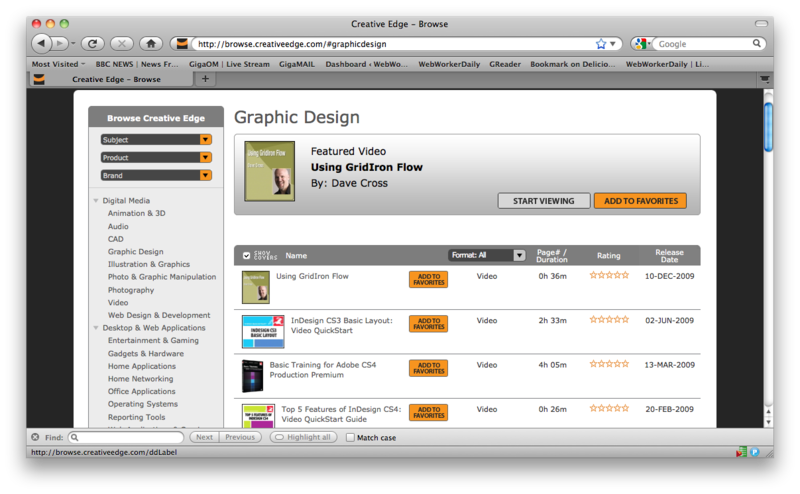 O’Reilly’s Safari Books Online earlier this week launched Creative Edge, a portal built for creative professionals. It’s an on-demand digital library of useful content — videos, books and tutorials — from a range of different publishers, including O’Reilly, New Riders, Peachpit, Wiley and Microsoft (s msft) Press. There are more than 3,000 items in the collection, covering topics ranging from web design and development to animation, 3-D modeling and photography. The folks at Creative Edge were kind enough to offer me the chance to look over the service, so I’ve been checking it out over the past week or so. There are two main ways to find content in the vast collection: browsing through it and searching. You can browse the collection by subject (for example, CAD or photography), by product (for example, CS4 or Cubase) or brand (for example, New Riders or Missing Manuals). When browsing, you can use the drop-down menu to only display videos, books or Short Cuts (shorter content on specific topics). You can also use the search tool, which I find particularly handy as it does a full-text search of all of the books in the collection. You can then sort search results by relevancy, popularity or when they were added to the collection (useful if you want to exclude out-of-date material). You can use the tabs at the top of the screen to limit search results for books or videos, and you can tag and “favorite” content that you’d like to come back to later. The online book viewing experience is great. Content loads quickly, it’s easy to read and there’s a table of contents on the left-hand side of the page which makes it fast to flip between sections. You can add your own notes and bookmarks, and search within books. The video experience doesn’t feel quite as polished; opening a video just opens a player in a new window — and it’s not as easy to find specific bits of information as there’s no search or table of contents. Any required supplemental files (code samples or graphics, for example) are provided for each video and book. Access to Creative Edge’s entire library requires a $24.99 monthly subscription (though it’s currently available for an introductory price of $19.99/month), which, given the size of its library, seems like a reasonable price if your book-buying budget is anywhere near that amount. Have you tried Creative Edge or Safari? How do you find they compare to buying “dead tree” books? 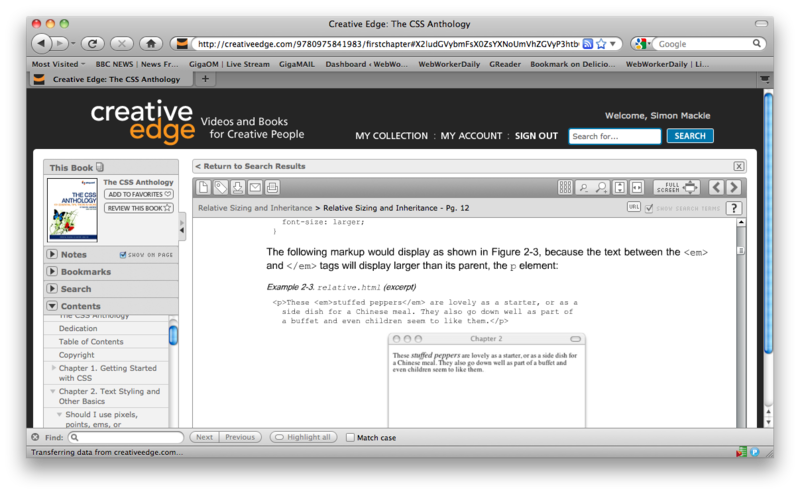 it is very confusing the difference between safari and creative edge. the sites seem to have overlapping books but the interfaces are miles apart and cost different. We have a sub. to Safari Books but I don’t see Creative Edge in here…is that a separate fee? It’s separate product that runs off a different domain. Creative Edge sounds like a valuable piece of software and it does have a nice, clean look to it (from what I can tell from these pictures) which I appreciate. But I’d be much more likely to try it if it didn’t require a monthly subscription. For some reason that really turns me off. I don’t like the idea of adding another recurring expense to my budget.